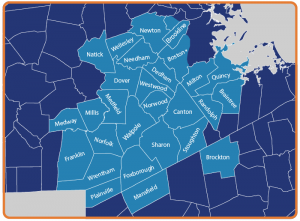 Since 1953, Prevett Oil Co. has been proud to serve the Westwood, MA area with reliable home heating oil delivery, superior customer service, commercial diesel fuel service, HVAC maintenance, and more. Our highly trained service team has the experience to install and maintain a wide range of heating and air conditioning systems. Prevett Oil customers take advantage of additional benefits like flexible payment plans, easy online bill pay, and online service requests. Please review the list of towns below to see if your home or business is located within our service area. Get in touch to become a Prevett Oil customer today!